Friday 18th of May saw the big finale of the 2014/15 season of the Persian Gulf Pro League. It was one of the most anticipated round of games in the last few years of the domestic Iranian football calendar. With three teams heading into the final day with a chance of taking the league title home. The big game was the clash of the top two teams in the league table. Tractor Sazi and Naft Tehran went into the game on equal points, knowing that a win would clinch their title triumph. But elsewhere in Isfahan, Sepahan, who were only trailing them by one point, knew all they had to do was win and hope the corresponding game would end in a draw. Unlikely scenario but anything is possible in football. Unlikely scenario did take place and as Tractor Sazi and Naft played out an exciting 3-3 draw in Tabriz, Sepahan celebrated their 5th league title as they beat Saipa 2-0. It was an exciting triumph, somewhat against the odds. A player whose performance proved to be crucial was Mehdi Sharifi. 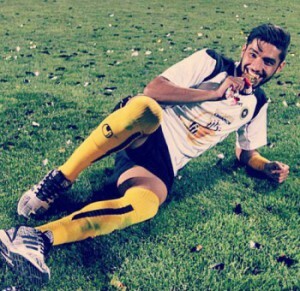 The 22-year-old Sepahan striker scored a brace in their victory over Saipa which landed Sepahan’s 5th league title in their history. A towering header and a great close-range finish took up his tally up to 12 for the season. Sharifi has been considered as one of the brightest talents in the domestic league for two seasons running. He was invited to the Iranian national team prior to the 2014 World Cup by Carlos Queiroz but was unlucky to miss out on the final squad. A menace for defenders all over the country, he has a combination of pace, great movement and even better finishing, attributes which have made him one of the best strikers in the league. However, he is part of a goalscoring machine which has been created by manager Hossein Faraki. An attacking quartet made up of veteran playmaker, captain Moharram Navidkia, experienced skillful attacking midfielder Mohammad Reza Khalatbari, Brazilian striker Luciano Chimba and his striking partner Mehdi Sharifi. This quartet racked up over 15 goals in the last 6 games as they won all of them to head to the top of the table. Sharifi’s intelligence in his link-up play is what makes him stand out. His ability to play simple one-twos with his midfielders and his great positioning in the box are all traits which puts him above up and coming strikers in the Persian Gulf Pro League. His partnership with Luciano has been a key point in Sepahan’s triumph and Navidkia’s presence behind the two guarantees goalscoring chances. It was an enthralling ending to the season, however it was marred by what took place at full time whistle. As the game in Tabriz ended 3-3, Tractor Sazi fans took the pitch to celebrate being Champions after rumours had falsely spread that the Sepahan game had ended 2-2 which would’ve made Tractor champions. But as the fans and players alike began to realise that they are not the newly crowned champions, the mood changed drastically which resulted in seats being broken and many other damages being inflicted in the stadium. There are many theories flooding around as to why and who had spread the wrong rumour, but Tractor Sazi feel they were harshly done by as they were told from the 86th minute that a draw would see them become champions. With all the strange and unlikely incidents taking place on the day, Sepahan fans celebrated their triumph. A title win that looked very unlikely 3 months ago, as even fans felt concerned about their team’s poor results and were asking for Faraki to be sacked, only for the manager to turn his team’s fortunes around and sneak through to the top of the table. This is Faraki’s second Championship medal in a row after winning the league with Foolad the previous season. One of the important facts in Sepahan’s unlikely journey to the top of the table is having the highest amount of players with experience of winning the league (8), something that Tractor Sazi didn’t have and Naft only had one. As the domestic league has come to an end, the focus has now turned to national team. Sharifi’s great performances in recent weeks have earned him another call-up to Team Melli. With some talented attacking players coming through the ranks in the national team setup, such as Sardar Azmoun and Alireza Jahanbakhsh, Sharifi is another player who can challenge for a starting spot in a team going through a transition. Fans all over the country have seen him turn from a shy and quiet player into a deadly striker who will, without a doubt, be in high demand this summer. A product of Sepahan’s successful youth academy, the club will look to retain his services for many more years to come.